WASHINGTON -- President Donald Trump pushed hard for the moment when he could deliver this State of the Union address with all the pomp the Capitol venue can offer -- robed Supreme Court justices, solons of the Senate, House Speaker Nancy Pelosi wearing suffragette white, and prime time on America's TV sets. Tuesday night, he used it to his advantage. The White House promised a "unifying" speech. Ken Khachigian, a former speechwriter for President Ronald Reagan, put it another way: "He gave them sugar cubes and vinegar in the same speech." One minute Trump was appealing to Democrats -- many of whom came dressed in white and determined not to respond positively -- with a call to end HIV, fight childhood cancer and provide paid family leave. The next Trump hit the left for supporting late-term abortion and made a case for funding a wall on the border with Mexico to reduce crime and illegal immigration. While many in Washington wondered how Trump would handle Pelosi, he was free to pontificate while the public could watch her face, and wait to see whether, for example, she would stand up when Trump said America would never be a socialist country. She did not. As House Democrats sat stoically, with many members dressed in white, Trump seemed to be enjoying himself. When he took credit for newly created jobs for women, House members playfully cheered him on -- as many of the female members were new to their jobs in the House. "Don't sit yet. You're going to like this," Trump countered. Then he noted the record number of women in Congress. Communications specialist and speech coach Ruth Sherman saw "good moments, affectionate moments that warm him up to a country that needs to warm up to him." But she said the 83-minute speech "was just too long." Sherman saw Trump dealing with issues that appeal to most Americans at the beginning and end of his remarks, but the middle of the speech was all about his push for $5.7 billion for a border wall, which Democrats oppose, as a Feb. 15 deadline to prevent another government shutdown looms. On Jan. 4, flanked by GOP House leaders, Trump took questions from the press in the Rose Garden as he argued that many federal workers supported the shutdown because they agreed with his push for border security. On Jan. 8, from the Oval Office, Trump warned the situation at the border had reached a crisis level. The on Jan. 19, from the White House Diplomatic Reception Room, Trump offered a compromise that would give the GOP money for the wall and Democrats temporary legal status for some undocumented immigrants brought into the country as children. On Jan. 25, Trump returned to the Rose Garden to announce that he would sign a spending package to end the shutdown even though it did not include money to address a crisis that threatens the nation's safety. But public opinion polls show that his many recent appeals have not bumped up support among American voters. A Gallup Monday reported that a survey that ended on Jan. 27 found that 60 percent of voters oppose a wall, up from 57 percent in June. January respondents essentially gave the same answers before and after the shutdown ended. The Gallup survey's margin of error was plus or minus 4 percentage points. In 2006, Gallup found that 56 percent of Americans opposed building a border wall. And a POLITICO/Morning Consult poll from Jan. 30 found that the number of voters who saw a "crisis" at the border -- 4 in 10 -- was virtually unchanged over the last three weeks of the shutdown. The percent of voters who opposed a wall rose slightly to 47 percent, compared with 45 percent who said they support it. The poll's margin of error was plus or minus 2 percentage points. 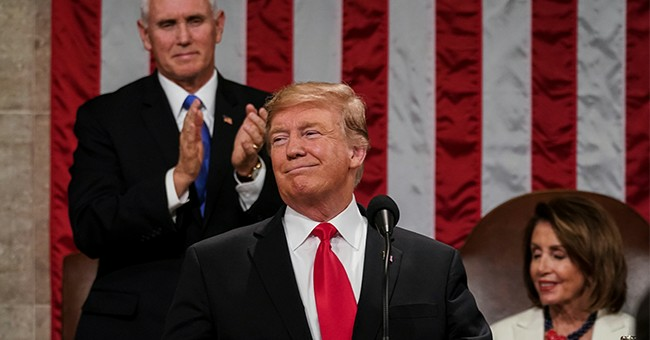 "He's had a chance to win the public over to his thinking on this, but in order to do that, he had to be more disciplined in keeping the focus on border security, not the wall," observed GOP strategist Matt Mackowiak before the State of the Union. Jeffrey Lord, a former Trump campaign adviser, however, told me that the address was all about "tactics, leverage, deal making. None of this should be taken for anything but what it is -- his view of how to negotiate."